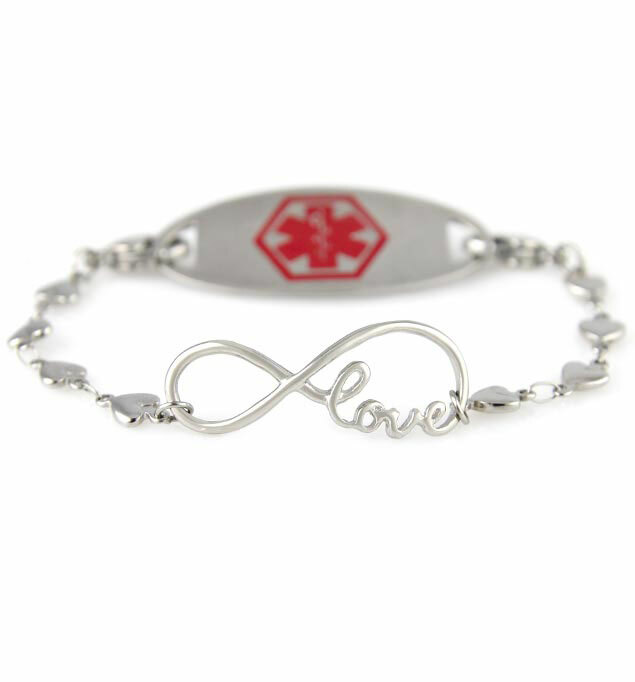 Centered on a darling heart chain, the I Love You For Always Medical ID Bracelet features an infinity symbol centerpiece with the word, “love” in elegant script on one side. This beautiful medical alert bracelet makes a particularly thoughtful gift, offering safety with style and a sweet reminder of your love. I Love You For Always is an interchangeable medical alert bracelet, which means you may simply open the two lobster clasps at either end to remove your medical ID tag, which you can then pair with any other Lauren’s Hope interchangeable medical alert bracelet. With just one medical ID tag, sometimes called a medical ID plaque or medallion, you can have countless medical alert bracelets to suit your mood, style, or activity.